Matrix Systems is a security provider that is 100% dedicated to physical access control and video surveillance. Our customers include well-known organizations in industries in which a security breach would be catastrophic, such as hospitals, airports, universities, and many commercial, industrial and government entities. Based in Miamisburg, Ohio, we have been designing, building and maintaining access control hardware and software for more than 40 years. We also work with valued-added Solution Partners to integrate our hardware and software seamlessly into a wide range of installations. With our heritage, singular focus, proven technology and commitment to service, we help our customers feel confident in their physical security installation. When you choose Matrix, you feel secure because you are secure. "To me, the best way to judge a company is by its customers." Matrix Systems, introduced “Aperta”, its revolutionary IP Device Controller, at the ISC-West show in Las Vegas today. APERTA™ was designed with the future in mind -- the Internet of Things (IoT), redundancy and high availability all built on a Linux platform. It comes with dual ethernet connections, USB and HDMI connections, eSATA ports, standard power input and/or PoE+ support. 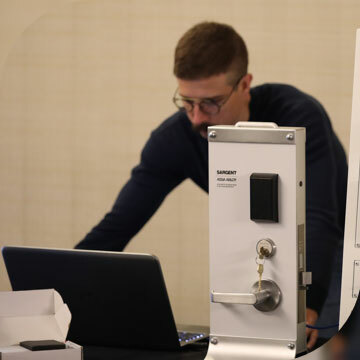 At this, back by demand, 2-day conference offers an educational opportunity to learn from industry experts about the most advanced technology and trends in access control and asset protection. Matrix Systems is growing! Matrix, headquartered in Miamisburg, Ohio, for over 40 years. Matrix Systems designs, installs and maintains technology systems that reduce risk, increase efficiency and ensure compliance, including best-in-class access control and video surveillance technologies to end- user clients across the United States. In addition, Matrix Systems develops, integrates and distributes the Frontier Integrated Platform to resellers in the security, IT and electrical contractor markets through a nation-wide channel of Solution Partners.